That all our cattle are like to spill. At Lehman College, Spring classes have been underway for almost a month. In this semester, “Spring” is a misnomer. At this point in time, probably more than a few students (and perhaps even staff) are entertaining visions of wind sand and an endless stream of waves gently rolling to shore, one after another in remarkably precise rhythm. With perhaps a little dose of imagination, that vision can be crafted to fit the current February. A seemingly perpetual blanket of snow plays the role of the sand, and a succession of waves of Arctic air originating in a region stretching from Siberia to Canada’s Northwest Territories fits the part of the surf. As a result, February has “waxeth cold” as few months have in New York City since recordkeeping began in 1869. Through February 21st, the mean temperature for New York City has been 23.6° or 11.0° below normal. Only seven months have had a lower average temperature. • 9 days with high temperatures below 32°, the most in February since 1979 when there were 15 such days. • 14 days with low temperatures below 20°, the most in February since 1936 when there were 15. • 5 days with low temperatures below 10°, the most in February since 1979 when there were 8. 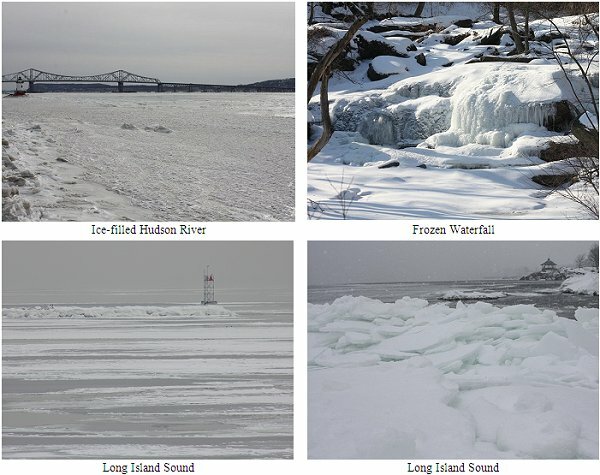 With the deep and persistent cold, streams, rivers, waterfalls, and even the Long Island Sound have been icing up. In recent days, the Long Island Sound has become seeming a mass of more ice than water. Despite the sting of Jack Frost’s icy breath this February, winter is filled with hidden beauty for all those who seek it. One example of late is a magnificent sunrise over ice that would have satisfied a range of artistic tastes. In the meantime, another Arctic blast is rolling into the New York City Metro Area. Right behind it, another one is following closely on its heels. 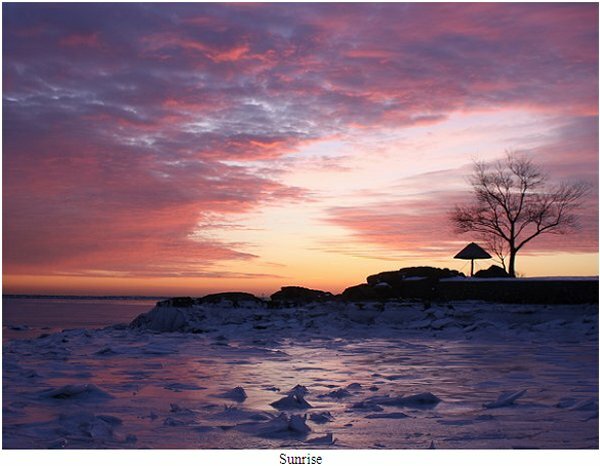 This entry was posted in Uncategorized and tagged Arctic, cold, February, Hudson River, ice, Long Island Sound, waterfall on February 23, 2015 by Don Sutherland.